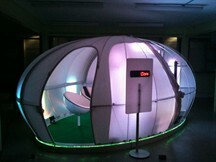 Coppa Club Sonning - more pods! Just released for bookings at Coppa Club, Sonning - four more exclusive outdoor dining pods! 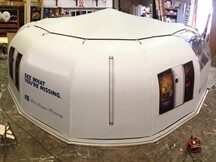 Just completed - our new pods in London! More locations to follow soon. 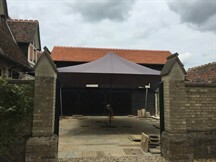 This large event canopy was flown back from Mallorca and was modified and re-used for a high profile polo event at the Royal County of Berkshire Polo Club. 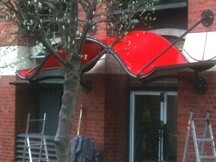 Bringing an old canopy back to life. 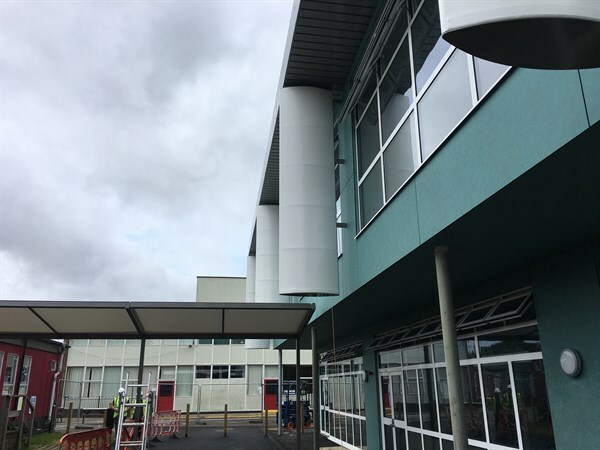 Installed by a company back in the early 2000's (that is no longer operating) - we replace these 'Pencil' canopy skins on a regualr basis for schools all over the country. If you have one of these frames in your playground - needing a new skin, drop us a call or an email and we'd be happy to help. 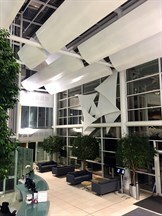 Just completed last week - some very strategically positioned sails for the reception of Ordnance Survey at their headquarters in Southampton. 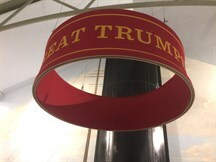 Delighted to assist with a printed overhead cylinder on this local scheme at the SS Great Britain's new 'Being Brunel' exhibition. Maintenance regularity changes with each site - especialy for interior sails. At the Falkirk Wheel, 18 months is about right as the amount of airborne dust and debris was quite high. Cleaned over a 6 hour period, the sails were vacuumed and wiped down ready for the new summer season. Call us on 0117 3812 016 if you'd like your canopy or sails cleaned. 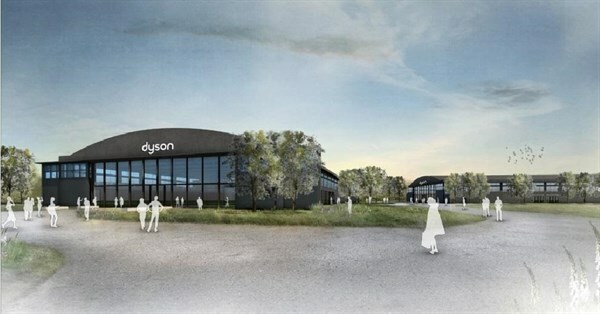 We're very pleased to be part of the team working on the new buildings for Dyson. The 100m x 50m wide building needed acoustic treatment, yet inspection of the 100 year old concrete roof is required on a regular basis. 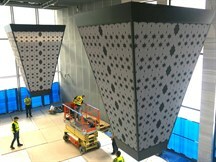 The solution we detailed, manufactured and are currently installing is 231 class O rated fabric panels - combined with an acoustically absorbent foam (which is out of sight). The project nears completion very soon! 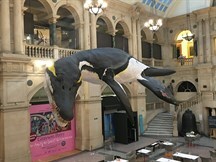 We were delighted to assist Bristol Museum with the rehanging of deadly Doris. Now her exhibition has closed, she has found a new home in the rear exhibition hall where she will thrill and delight visitors from all angles! 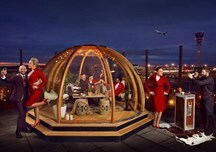 We were thrilled to create this exclusive pop-up dining igloo for Virgin Atlantic at Heathrow in collaboration with the Coppa Club! 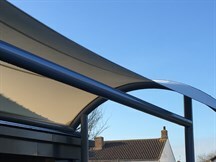 A lovely residential canopy offering weather protection for the balcony area and entrance. 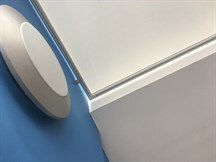 We designed and installed four flat fabric ceiling panels to prevent cold drafts wafting up through the open-plan stairwell at this clinic. Great to see the adventure playground now open at Hever Castle - well done Duncan and Grove. 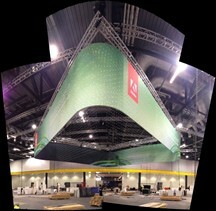 We were very happy to supply a very small element to the structure - let the play begin! 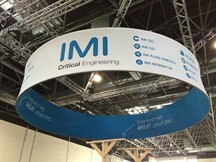 For this medical conference in Milan we created continuous ribbon branding around the stand. 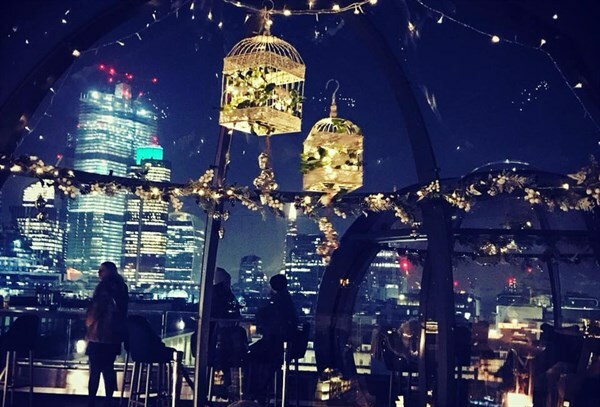 Stunning al fresco dining domes or 'igloos' created for the Coppa Club restaurant by the Tower of London and Tower Bridge. Very happy to assist Design Rock once again - with these classic overhead elements. Printed on to a blackout fabric, there is no shadow from internal frame or from the rear graphics. Supplied with a strong case for use at the next show! Recently completed but awating some nice photographs - this simple entrance canopy visually lifts the entrance to this plain box-like building. We are delighted to be working with Paragon Creative on the construction of this cylinder which will be installed in Kuwait later this year. 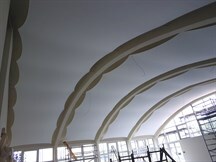 We are pleased to have solved the rather long reverberation time issue at this school in Tulse Hill, London. 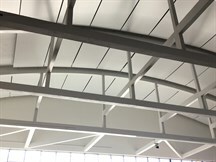 Installed over the entire 4 bays of the ceiling, the sails fix via rigging screw tensioners to the down stand beams - and therefore follow the curve of the existing roof. 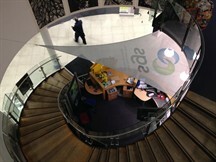 Our printed reef sail really draws the eye and makes a great alternative to traditional retail signage. 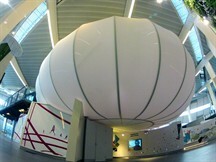 We were commissioned to create these two eye-catching hanging lanterns for the Museum of Arabic Science in Kuwait. We had a busy (and hot) week last week on site at Goodwood Festival of Speed working with Audi and Mini to create some spectacular stands. The event starts on 29 June! Doris the pliosaurus is now open to the public! 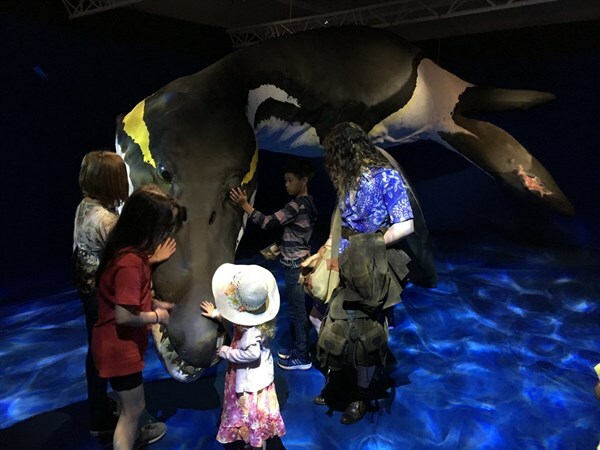 We were delighted to assist Bristol Museum with suspending the dinosaur for this wonderful exhibition! 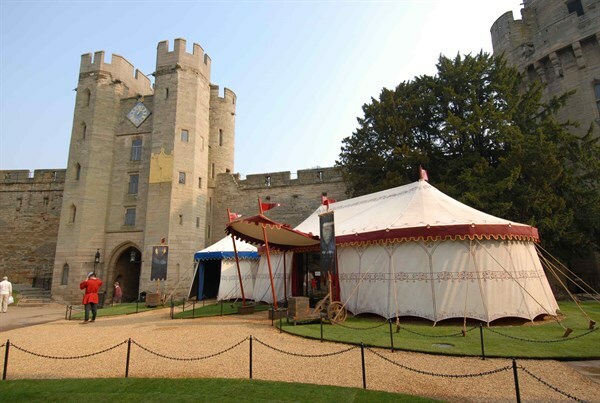 We are pleased to have been asked to update the structure at Warwick Castle for the dungeon entrance, matching the existing canopy fabric that we installed a few years ago. 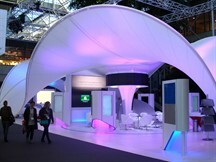 We completed this internally-lit cone to form the centrpiece and highlight the bar area at this exhibition. 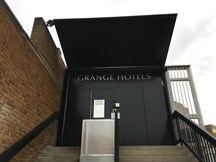 A temporary entrance canopy was required at this hotel while town regneration works are underway. 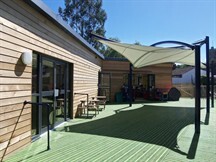 A fabulous barrel vault canopy spans the back of this school building to create covered outdoor space for learning and play. 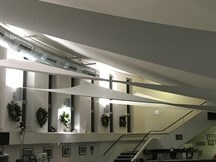 We helped Exeter University with an acoustic issue they had in the Cafe/Bar at the Northcott Theatre on the main campus. 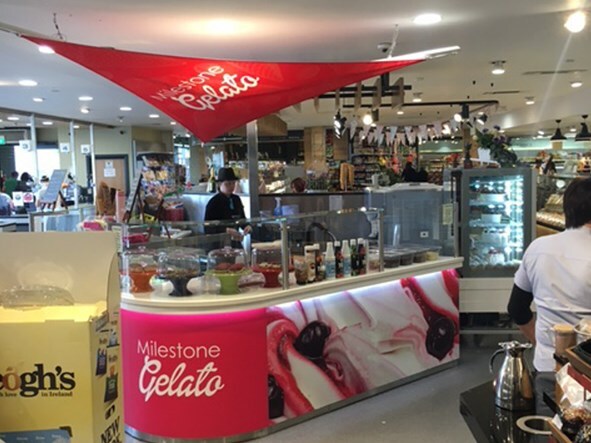 We built an elegant touring canopy for Waitrose to protect their staff and customers from the elements of the Bristish summer. 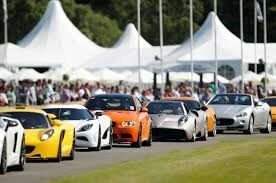 It toured over a number of sites, ending at Carfest South in the late summer. It may tour again in 2017! 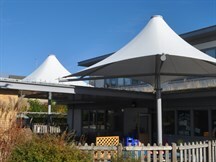 Another example of our classic cone canopy - the Corona - which is both eye catching and provides sun shade for the pupils at this school. A strong new entrance canopy, providing weather protection and a clear route for the residents of this newly built retirement village. 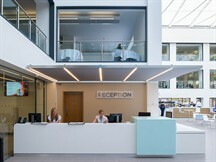 A classic double conic form makes a real feature for this entrance area at Sword Apak's new offices. A bespoke double conic canopy has transformed ths terrace into an outside cafe and entertainment space. 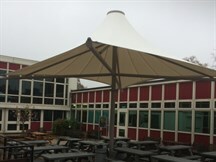 We transformed this disused space into a school dining courtyard using our classic Corona canopy. 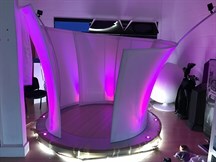 This venue transformation was carried out as part of a conference for the end client with stunning results. 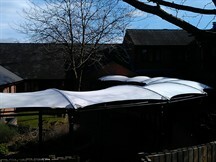 Two Corona canopies give the wow factor and offer all weather protection at this school. 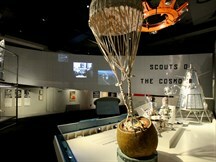 We are exceptionally happy to have assisted with this iconic exhibition tracing the history of the Cosmonauts. 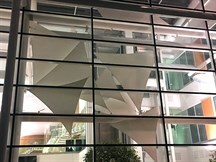 Working with the HUB and Real Studios, the 'sweep' forms a visual screen, separating space and providing projection surface. 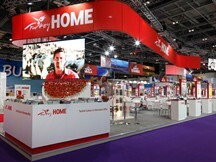 We've helped Design Agency Epoch with a summer 'Hug me' exhibition for Coca Cola. This cone canopy was installed to create an outdoor entertaining area at this private residence. 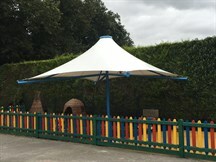 Chew Magna Primary School is thrilled with its new playground canopy! 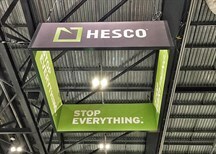 Designed to replace an inferior structure manufactured by another company, we manufactured this new system for Elsteel's exhibition stand in Hanover. 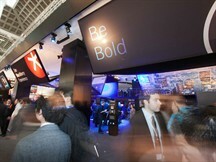 The stand now tours world wide. This cantilevered canopy structure that we designed specifically for this disused space at a Bristol Academy has helped transform the area. 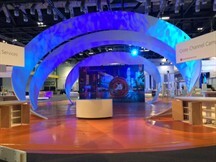 We created this stunning halo-like fabric centrepiece for the Adobe Summit in London - this is the third year running for this client. 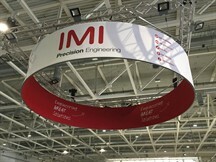 For this client we re-used the frame and added new skins on this 6m cylinder form - altered branding, same clean lines. As part of our ongoing excellent relationship with Bristol Museum and Art Gallery, we have assisted with a unique installation. 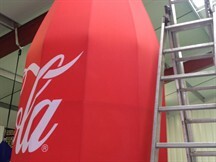 We helped solve a problem for the reception area of this college campus with a branded sail structure. 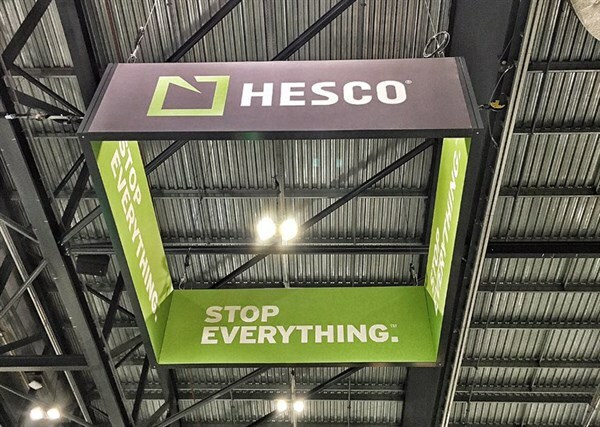 Based on our Zefira product structure, we created this eye-catching suspended sign which is quick to build, easy to transport and reusable. 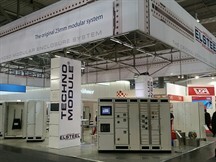 We created a strong branding message and eye catching signage for this exhibition stand. 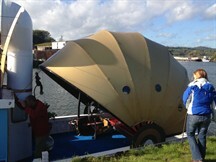 We worked on this exciting project for Channel 4's 'Tom's Fantastic Floating Home' to create a funky folding canopy for Tom Lawson's boat. 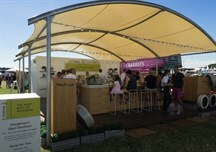 We helped create a fantastic outdoor exhibition space for Audi at the Goodwood Festival of Speed. We created this stunning backdrop canopy for the catwalk at the V&A's 'The Glamour of Italian Fashion 1945-2014' exhibition. 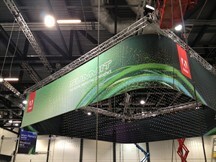 We installed this eye-catching structure at the ECTRIMS conference which took place in Copenhagen. 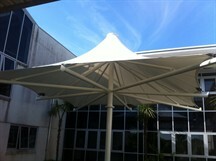 Tensilefabric completed this Corona Canopy for Truro College in time for the start of the new academic year. 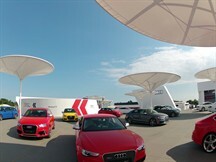 Just completed for Audi, in conjunction with HelmX, Tensilefabric supplied and installed this simple fabric skin to provide shade protection for the queuing canopy for Audi's stand at Goodwood 2013. 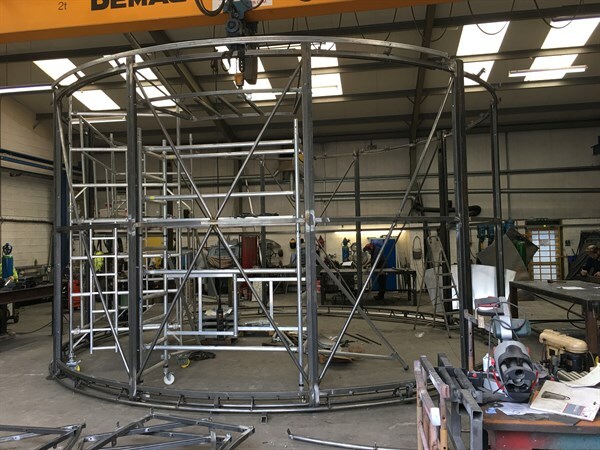 Being produced for a touring scheme for the launch of a new phone for Nokia - this structure comes in kit form, is built in around 3 hrs and is able to be used outside and inside. Complete pictures to follow after its first install! We have recently created a bespoke large interior projection screen on an aluminium frame with some printed elements for ASOS's Head Office. 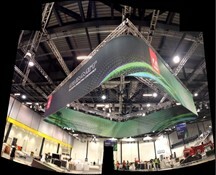 We have just completed an overhead canopy banner for the Adobe Summit 2013 - The Digital Marketing Conference which took place on 24 April 2013 at the Excel Centre in London. 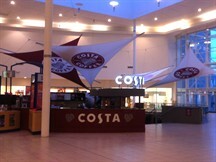 Last month we completed an eye-catching sail arrangement for Costa Coffee. 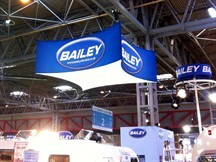 We have just completed this overhead sign for the Bailey Caravans' stand at the Spring Caravan and Camping Show 2013. Now complete - referred to as the Egg for those who have been working on it, the outside skin of the Mega Theatre at the Siemens Crystal is now complete. 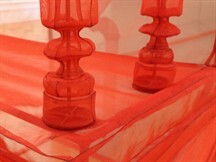 The form, designed to be understated and simple adds a degree of softness into the very linear exhibition. 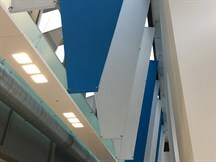 We completed two acoustic reception canopies incorporating lighting for Trowbridge County Hall. 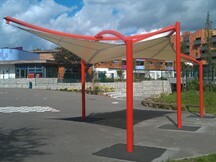 We completed this canopy prior to the beginning of the new term Autumn 2012. The canopy has been installed to enhance the appearance and provide valuable rain protection for students walking between buildings. 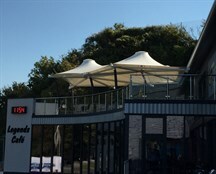 Working with RMB Projects, Tensilefabric completed the installation of an Amoeba-like form as part of a major refurbishment by a popular UK holiday park. 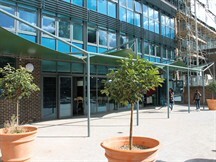 In May 2012 Tensilefabric completed this entrance canopy job for the Browne Jacobson LLP office building in Nottingham. 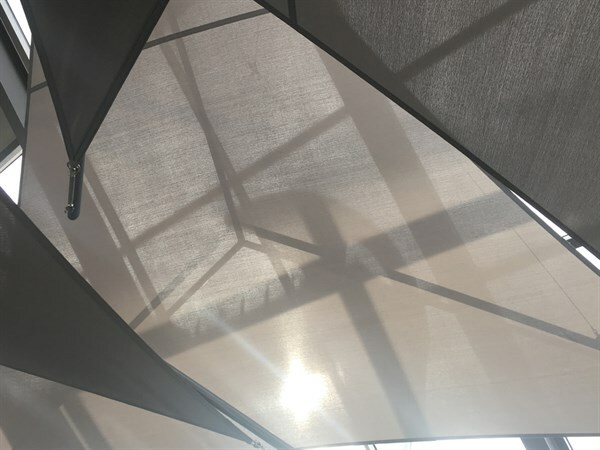 April sees the launch of TensileFabric's new product range of exterior canopies - click here to view the full "Star" canopy range. 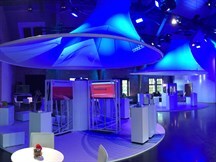 Tensilefabric provided printed zig-zag style fabric canopy ceilings for the Blackberry Mobile World Congress Exhibition in Barcelona in February 2012. 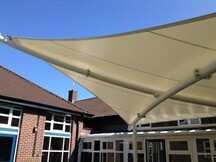 During October 2011 Tensilefabric were asked to detail, manufacture and install the replacement canopies at Lincoln House Care Home in Crewe. 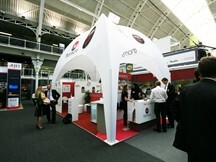 Completed in summer 2011, Tensilefabric designed and installed the die sublimate printed dome at the Business Design Centre. 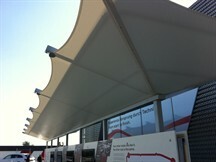 Tensilefabric installed this smoking shelter in late 2011 ready for the opening of the new Westfield Shopping Centre in Stratford. 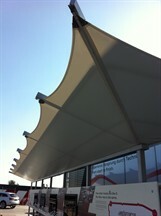 Tensilefabric completed these exterior PVC canopies for the new school year in September 2011. We fixed down to cube foundations and installed them over a four day period. 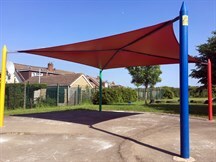 Tensilefabric completed another bespoke school canopy, this time at a primary school in Hartlepool. 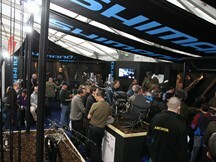 Working with PDK and Shimano directly, this Exhibition for Shimano Fishing used large sail style banners with huge text, to bring large branding to the stand. 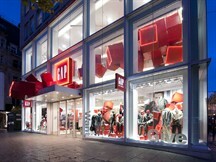 Tensilefabric designed, manufactured and installed the window display for Gap's Flagship store on Oxford Street, London and their Paris store on the Avenue Champs Elysées ready for their Christmas season. Our brief was to draw up and manufacture a display to the exact specifications of the client’s visualised design, which consisted of an array of Christmas present parcels stacked and hanging in a curved formation across the expanse of the window, over the entrance door and at floor level. It was important to recreate as accurate as possible this design due to it being based upon Gap’s more simpler Christmas window displays rolled out throughout their network of smaller stores. These stacked Christmas parcels (cubes) were to appear, though curved in form, balanced upon one another. To achieve this all forms of support and suspension were to be as invisible as possible, therefore on ground level fixtures were internal to the structure and at high level the display was hung by unobtrusive stainless steel cables. Rigged over three nights, the low level structure consists of a freestanding curved steel support of which the cubes were threaded onto in a precise manner. 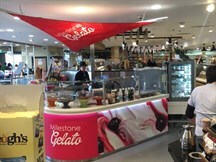 The high level structure was fixed to the existing framework within the shop and a secondary steel truss framework, installed by us. The cubes, made out of MDF, had either a high quality spray paint finish or were covered with a specialised glitter fabric. The glitter cubes were finally brought to life with attached neon lights. Curves, Curves, Curves – a tunnelled vista well worth pausing to enjoy. Tensilefabric found their curvaceous acoustic screen, the back drop to the reception of Dentsu, as the opening snapshot for an article in OnOffice. 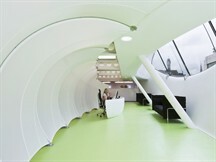 The article describes the new interior as white spaces and voluptuous curves with splashes of colour. On entering the reception area at Dentsu the article goes on to say that ‘the acoustic screen made by Tensilefabric…gently arches down the space, creating a tunnelled vista well worth pausing to enjoy.’ That ‘not only is this screen an attractive feature in it’s own right, it is also part of the Interactive Space’s desire to not alter the base build too much.’ Therefore, pointing out that tensile fabric structures can both compliment a space aesthetically whilst providing a practical service. 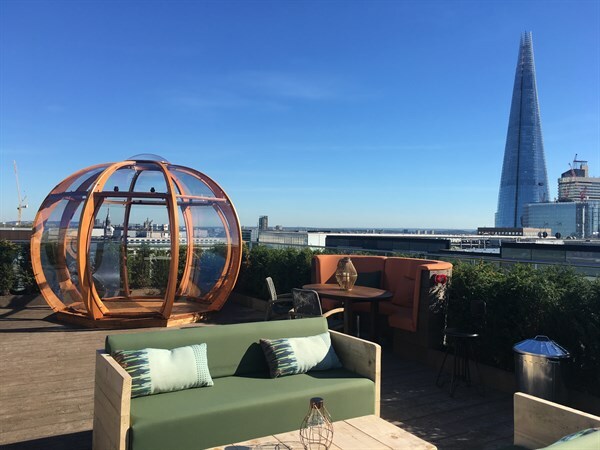 OnOffice could do nothing but compliment this new workspace designed by Nigel Tresise, the design director at Interactive Space, and this was a project that we at Tensilefabric were proud to be a part of. 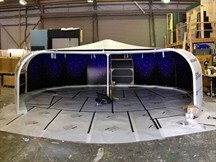 Tensilefabric designed and manufactured this Pod for the Conference Connection for one of their well known high street retail clients, as part of a touring exhibition providing information to their staff. 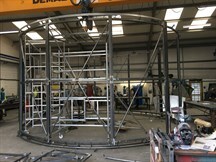 The Pod is constructed from aluminum laser cut profiles which form the outline of the frame (these are 90 degrees to each other on plan), in filled with GRP glass fibre rods to form the skeletal frame. 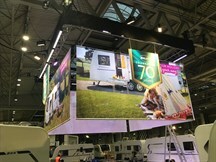 The finished frame was then skinned with a spandex type fabric chosen due to its stretch, its good qualities for staying clean and light transmission values. 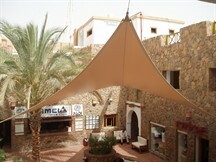 Tensilefabric installed this exterior courtyard canopy in Sharm El Sheikh, Egypt. During the design process we had to consider sun protection requirements whilst creating a visually stunning feature within the courtyard of a hotel and diving school. 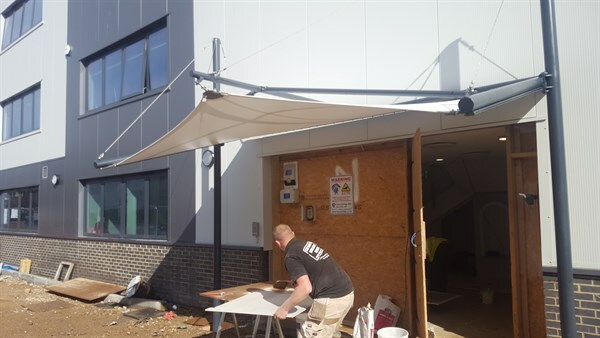 Tensilefabric designed, manufactured and delivered the canopy whilst the experienced client (used to dealing with such products) were happy to install the canopy themselves. Further products at the same site are pending. 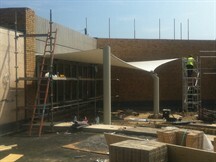 This canopy has been installed for the Noah's Arc playgroup to provide both rain and sun protection. Additional vertical sails (not added yet) add to the sun protection from the afternoon summer sun, providing excellent outdoor play space. 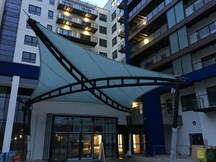 This canopy required 5 weeks for design, 7 weeks for manufacture and around 2 weeks for installation including foundations. Designed with attention seeking in mind, this canopy was commissioned to draw the attention of visitors to the entrance of this 1980s building in Bletchly. The client requested a canopy that would stand out and highlight their reception area, so that guests knew immediately where to head for. 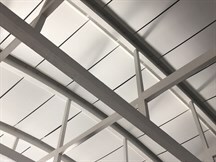 The canopy incorporates a gutter edge detail on the fabric, down the uprights of the structure, channeling the water to the front centre to a soak away and to either end at the rear, where it surface drains. 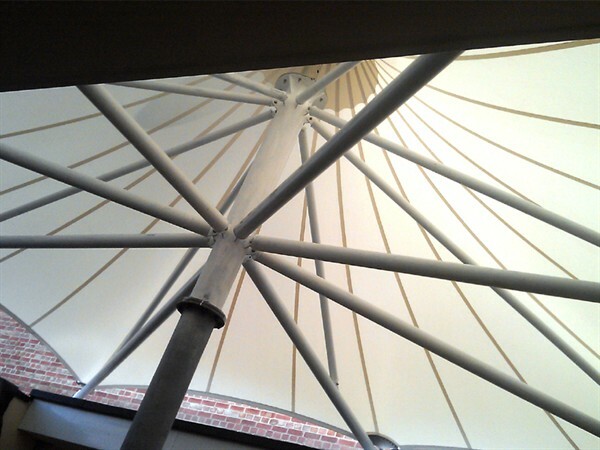 The canopy is made from PVC coated polyester with a powder coated galvanized steel tubular frame. All rigging and clamp plates are 316 stainless steel.